Battle of the Gods slots offer with two bonus features and really rewarding base game. Join the battle between the Titans and the Gods and claim your prizes! 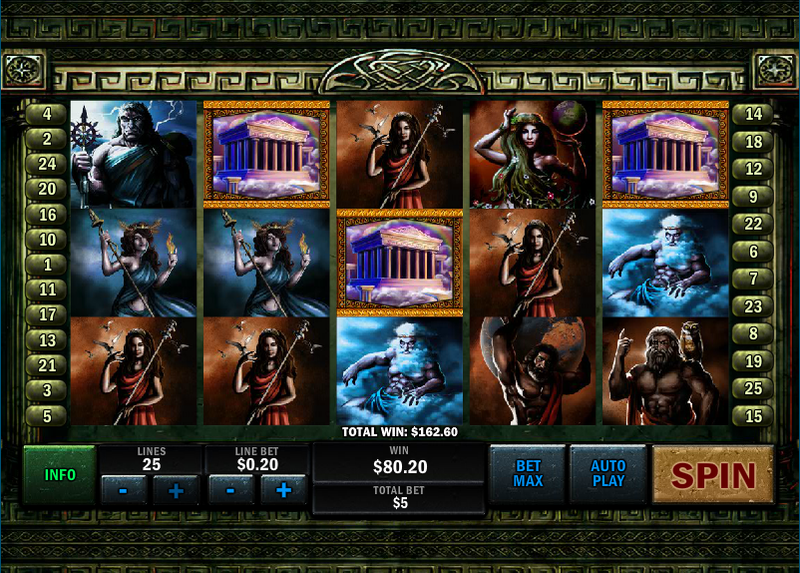 Mythology themed slots aren’t uncommon, in fact, there are plenty of such games, but this one is really special. Battle of the Gods slots delivers two bonus features and a really rewarding base game. Join the battle between the Titans and the Gods and claim your prizes! Mythology themed slots aren’t uncommon, in fact, there are plenty of such games, but this one is really special. Battle of the Gods slot was released in 2014 and it attracted immediate attention. It is a Playtech game and if you know a thing or two about online slots, you have surely encountered the name Playtech before. 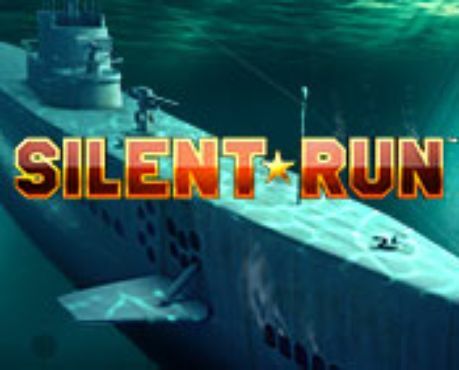 This company is one of the key and most successful online slots developers and they have created some of the most popular and most renowned games in history. Even though Battle of the Gods slot features a mythology theme, there is a certain comic-book feel about it and the symbols look like they’re out of an alternate mythological reality, you won’t see any classical representations of Zeus, Athena, Aphrodite and all the others. The Titans are represented as the gods’ evil counterparts and this duality justifies the name – Battle of the Gods slot, because the game indeed shows us a battle of gods (well, gods and titans, but let’s not split hairs now). 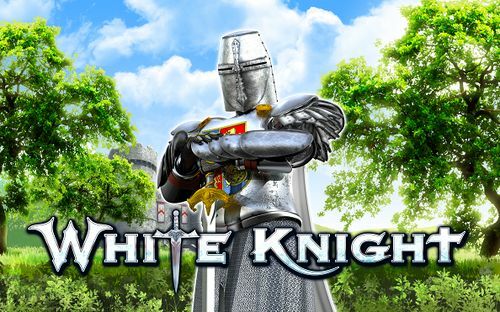 Even though the atmosphere may seem a bit darkish, it is actually a pretty fun and exciting game. The controls are quite straightforward, and the game is generally quite user-friendly, although that can be said, pretty much, of all Playtech games. The reels are based on a dark green wall with typical mythological carvings with several bigger symbols around at the top. The symbols are perfectly drawn and that’s the thing that will flash in your eyes once you open the game. The music is also in accordance with the theme, it is slightly spooky, slightly scary, but not too overwhelming. Battle of the Gods offers a standard five reels, 25 paylines gameplay where play with as little as 1p and as much as £50 per payline. That sets the minimum wager at just 25p and the maximum amount that you can wager per game at a maximum of £1,250. 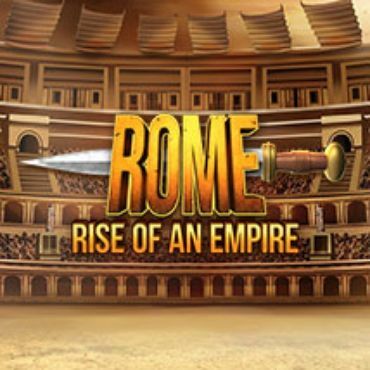 Very few games offer such a degree of flexibility and we have to note that Battle of the Gods slot is quite suitable for high-rollers and players who are willing to make slightly riskier wagers. You can adjust the lines or hit the ‘Max Bet’ button to increase the coin value to £50 across 25 paylines. You all also free to choose any stake in between. You may wager £1 per line, 50p per line, or £5, it is totally up to you. Of course, as it is the case with other games, if you play with a higher stake level you will be able to win more if you hit a winning combination. If you wish to set the reels to spin for a number of spins, without your interference, just click on the auto play button, select the number of spins and let them roll. Bear in mind that the selected auto spins will be at the same stake level, so choose wisely. You may stop the auto play whenever you want and continue manually. Since this game is called Battle of the Gods, the symbols are divided into two categories – gods symbols and titans symbols. 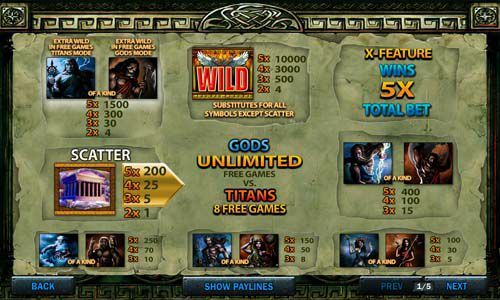 The gods appear on a blue background in Battle of the Gods slots, whereas the Titans are presented on a dark background. There are five members of the ‘gods’ team’ and five members of the ‘titans’ team’ and each member of the gods’ team has a respective counterpart from the Titans’ team. You will win a minimum of five coins for three symbols across a payline and the payouts for four or five symbols are a lot larger. You must get the symbols from the leftmost towards the rightmost reel to score a win, but that doesn’t apply to the scatter which pays regardless of the respective positions on the reels. Apart from these symbols, there are a Wild and a Scatter symbol presented as the special symbols of Battle of the Gods. The Wild symbol is the Wings symbol and is a substitute for all the normal symbols of this game. It can also form a winning combination on its own, and by landing 5 of them you will end up with massive 10,000 coins in your stake. The scatter symbol is the Temple, and it also pays a prize for two or more on a payline. Apart from that, if you manage to land three or more, you activate the free spins feature of the game. There are two kinds of different spins in Battle of the Gods – the Titan Mode and the God Mode. 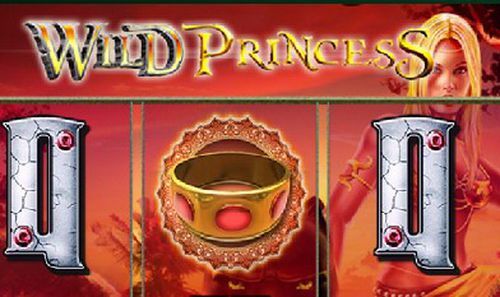 You start off in the Gods mode with unlimited free spins and three symbols available, the Gods symbol, Titan Extra Wild symbol and Wilds symbol. As soon as you get a Titan Extra wild symbol on the 3rd reel, you are taken to the new screen and you play Titan’s Mode. 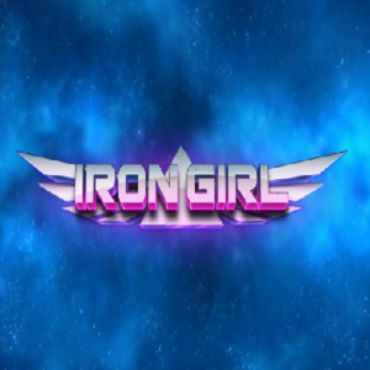 Here you have 8 free spins, and Titans symbol, Wilds symbol and God Extra symbol available. You can switch from one to another game several times until there are no free spins left in Titans Mode. The special wild symbols that appear in free spins mode, can generate some pretty hefty wins, including up to a maximum of 1,500 coins for five of a kind. This is a perfect online slot that divides itself from the other Greek mythology slots because of the infinite number of free spins. The design itself is really satisfying and the base game is rewarding. 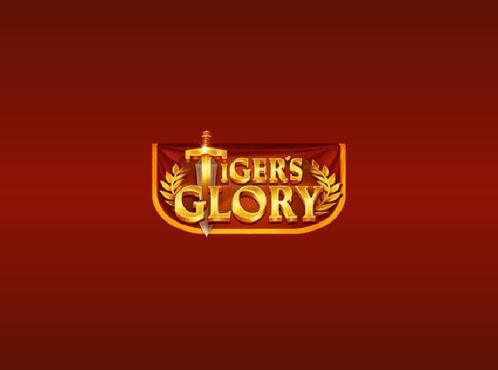 Overall, the Battle of the Gods slot is a really impressive piece of art developed by Playtech that will make every player want to play the game. The game’s RTP percent is 94.04%. Check it out at some of our sites, claim the special bonuses that we offer and enjoy your game time!